A meteor during the Geminids shower early Monday morning passes a bright star in the east, one that I will call the Star of Bethlehem, just in keeping with the season's spirit. The Geminids meteor shower peaked early this morning with a brilliant display over North America. For viewers in Central Florida, ambient light often creates problems, but the shooting stars were so bright that the cities' glow wasn't a hindrance. I'll write more about this occasion in a later post, but for now, this is why I'm using this photo for today's edition. The Star of Bethlehem, as it is commonly known now, led the wise men to Jesus' manger after his birth. Astronomers and theologians have debated as to whether this "star in the east" was actually a living star, a supernova, a planet or some other celestial phenomenon. The Geminids radiate from the east, and I took many exposures of the eastern sky in an attempt to capture a meteor and a bright star in the same image to represent this aspect of the Bible's Christmas story. 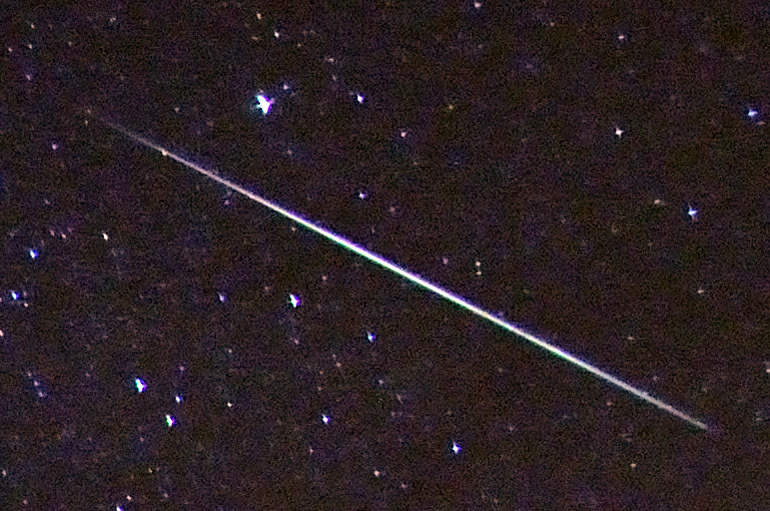 The above image is one of several bright meteors I managed to capture during several 13-second exposures taken at a high ISO setting, hence the graininess. The brightest point of light in the photo is, indeed, a star in the east, though I couldn't say exactly which one. The actual meteor left a smoke trail that lasted less than a second but was visible to the naked eye nevertheless. For hours Monday morning, I sat on the sand in Cocoa Beach, taking hundreds of photos of the night sky, which cleared magnificently after a freak period of clouds - the first of two rare weather events in the same day in Brevard County (more on that later). In the still night, I sat with my head tilted upward, my iPod pumping Christmas music into my ears. The meteors were separated only by seconds. When "O Holy Night" began to play, the evening was complete.